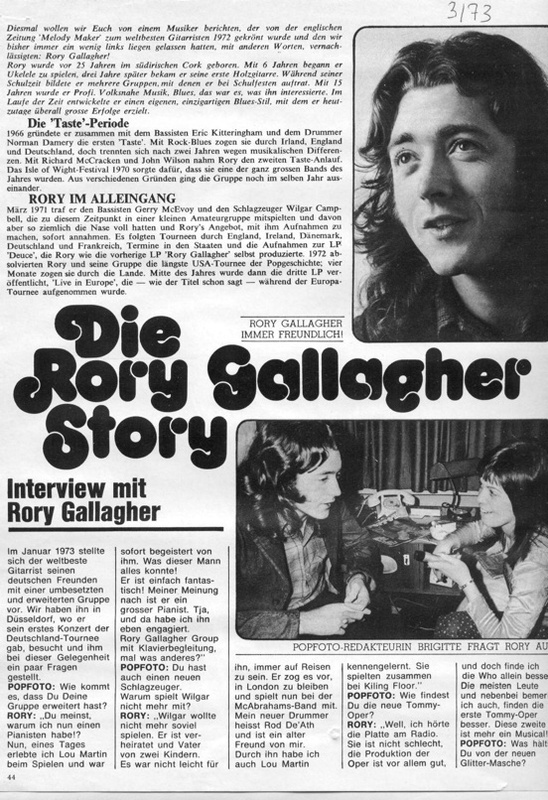 The following is a translation of a Rory Gallagher interview published in the March 1973 German edition of Popfoto Magazine. 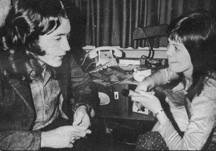 Brigitte Lehmann, former journalist/photographer for the pop magazine, Popfoto, conducted the interview on January 12, 1973, in Düsseldorf, Germany. Rory is set to start a tour of Germany with new drummer Rod De’ath and keyboardist Lou Martin and his first show is at the Philipshalle in Düsseldorf with Alexis Korner as supporting act. Included in the Popfoto article is a review of the Philipshalle concert as well as a short biography of Rory. Click on the thumbnail pictures below to see scans of the original Popfoto article. This time, we would like to tell you about a musician, who was crowned by the British paper “Melody Maker” as world’s best guitarist of 1972 and whom we always – until now – have a little bit ignored, in other words, neglected: Rory Gallagher! Rory was born 25 years ago in the southern Irish Cork (should be Ballyshannon, but that was not mentioned in his bio). With 6 years, he started playing ukulele. 3 years later, he got his first guitar. During his school years, he formed several groups, with which he performed at school events. At the age of 15, he turned pro. Folk music and Blues that was what interested him. Over time, he developed his own unique blues style, with which he achieved nowadays great success everywhere. In 1966, he co-founded with bassist Eric Kitteringham and drummer Norman Damery the first “Taste”. They played Rock-Blues and toured in Ireland, England and Germany, but separated after 2 years because of musical differences. With Richard McCracken and John Wilson, Rory took the second Taste-start. The Isle of Wight Festival in 1970 saw to it, that they were one of the greatest bands of the year. For various reasons, the group split in the same year. In March 1971, he met bass player Gerry McAvoy and drummer Wilgar Campbell, who were playing in a small amateur group but were pretty much fed up with it. They accepted Rory’s offer to record together immediately. 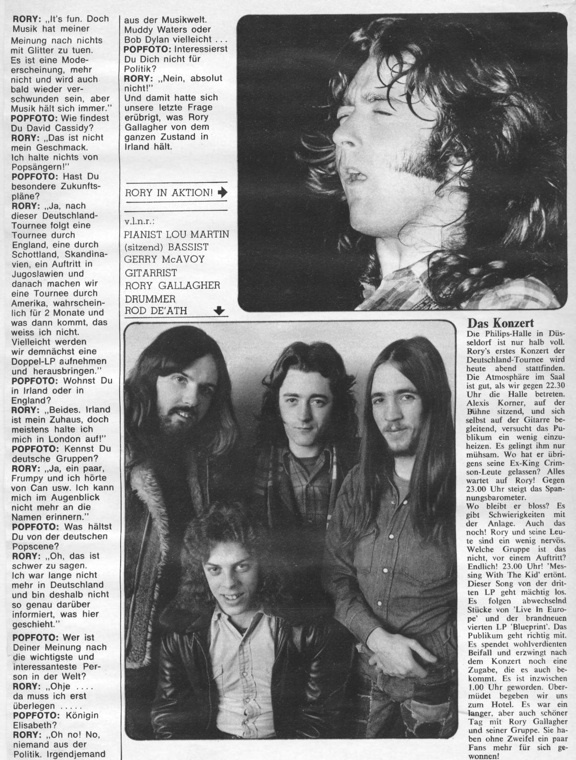 This was followed by tours of England, Ireland, Denmark, Germany and France, gigs in the States and the recording of the second album ‘Deuce’, which was, as the previous LP ‘Rory Gallagher’, self-produced. Rory and his group completed in 1972 the longest U.S. tour in pop history; for four months they roamed the land. In the middle of the year, the third LP was released ‘Live in Europe’, which – as the title suggests – was recorded during the European tour. In January 1973, the world’s best guitarist introduced to his German friends his reshuffled and expanded group. We visited him in Düsseldorf, where he gave his first German concert of the Germany-Tour and asked him on this occasion a few questions. Popfoto: How come that you’ve expanded your group? Rory: You mean why I now have a piano player? Well, one day I saw Lou Martin while he was playing and I was immediately smitten by him. This man has everything! He is just fantastic! In my opinion, he is a great pianist. Well, and I just hired him. Rory Gallagher Group with piano accompaniment, that’s something else. Popfoto: You also have a new drummer. Why is Wilgar no more with you? Rory: Wilgar no longer wanted to play so much. He is married and has two children. It was not easy for him to be always on the road. He preferred to stay in London and now plays with the band McAbrahams. My new drummer is Rod De’Ath and is an old friend of mine. Through him, I also met Lou Martin. They played together with Killing Floor. Popfoto: Do you like the new opera Tommy? Rory: Well, I heard the record on the radio. It is not bad, the production of the opera is well above all, and yet I find the Who better alone. Most of the people and by the way, I also find the first opera Tommy better. The second is more of a musical! Popfoto: What do you think of the new Glitter music? Rory: It’s fun. However, music in my opinion has nothing to do with glitter. It’s a fad, nothing more and will be soon gone, but music will always stay. Popfoto: What do you think of David Cassidy? Rory: This is not my taste. I do not like pop singers! Popfoto: Do you have special plans for the future? Rory: Yes, this tour of Germany will be followed by a tour of England, Scotland, Scandinavia, a gig in Yugoslavia and then we will make a tour of America, probably for 2 months and after that, I don’t know. Maybe we will record and bring out a double LP. Popfoto: Do you live in Ireland or in England? Rory: Both. Ireland is my home, but I spent most of my time in London. Popfoto: Do you know German groups? Rory: Yes, a few. Frumpy and I heard of Can. At the moment I cannot remember other names. Popfoto: What do you think of the German Pop scene? Rory: Oh, it’s hard to say. I was not in Germany for a long time and therefore have not accurate information about what is happening here. Popfoto: Who do you think is the most important and most interesting person in the world? Rory: Oh no … Let me think first…. Rory: Oh no! No, no one in politics. Someone from the music world. Muddy Waters or Bob Dylan, perhaps…. Popfoto: Are you not interested in politics? And thus…no need of our last question, what Rory Gallagher thinks about the political situation in Ireland. The Philipshalle in Düsseldorf is only half full. Rory’s first concert of the Germany-Tour will take place this evening. The atmosphere in the hall is good, as we enter at 22.30 o’clock. Alexis Corner, sitting on the stage, accompanying himself on guitar, is trying to warm up the audience. He manages with difficulty. Where are by the way his ex-King Crimson people? Everyone is waiting for Rory. Around 23.00 the stress barometer increases. Where is the band anyway? It seems that there are difficulties with the sound system. Rory and his people are a little nervous. Which group is not upon a performance? Finally! ‘Messing with the Kid’. This song from the third album is coming on strong. The following are alternate pieces from ‘Live in Europe’ and the brand-new fourth LP ‘Blue Print’. The audience goes with it. It gives well-deserved applause and forces after the concert an encore. It’s now 1.00 o’clock. Tired we go back to the hotel. It was a long but rewarding day with Rory Gallagher and his group. They have no doubt a few more fans won over!